Influencer marketing has completely revolutionized social media marketing. 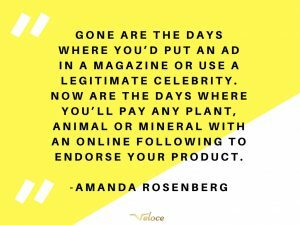 People no longer listen to top celebrities in the same extent they did back in the days, and instead, they trust recommendations from peers who are industry experts within a specific niche. Just a few years ago, social media influencer marketing in the form that we know it as today was almost non-existent, and in just a few years, it has exploded, where today, it is at a point where everyone is talking about it, and brands are asking how they can benefit from it. 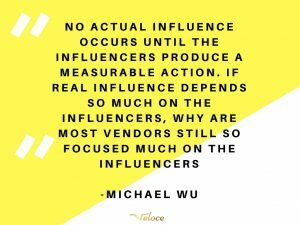 In this article, I’ve compiled some of the top influencer marketing quotes that describe influencer marketing, gives us a better understanding of what influencer marketing really is, and much more. 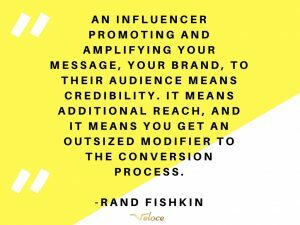 The influencer marketing quotes come from industry experts with years of expertise in the area, and who understands the true power of influencer marketing and how it can be leveraged for great marketing results. 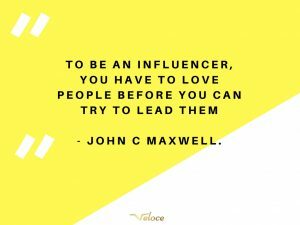 If you have more influencer marketing quotes to share with us, we’d love to hear about them, and also add them to this list. 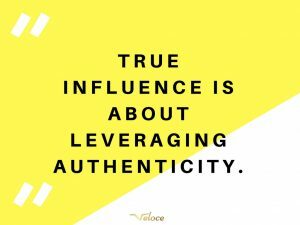 Real influence truly is about leveraging authenticity, because the fact of the matter is that in order to build influence, people neet to trust and look up to you, and if you aren’t authentic, people won’t trust you. The only way to become a real influencer is thereofre being authentic and trustworthy. 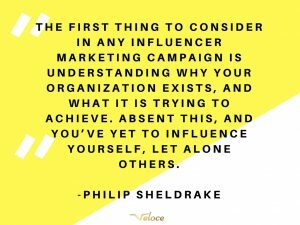 This influencer marketing quote refers to the fact that in order to be able to lead people, you need to have influence over them. 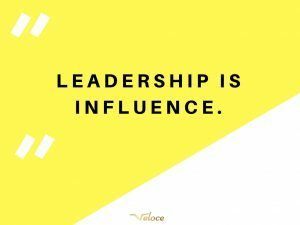 If you can’t influence them , and they don’t look up to you, it will be impossible to be a leader. Relationships equals influence, becuase when you build relationships with people, you also build trust. Moreover, the only way to build successful and sustainable relationships is to make them mutually benefical. This is the foundation for all successful influencers, because if the audience feels like they are being used, they’ll leave the influencer. 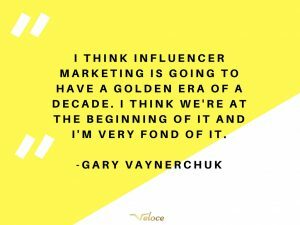 This influencer marketing quote by entrepreneur Gary Vaynerchuk tells us that while influencer marketing has exploded in popularity, it is only in its baby stages, and it will continue to grow. 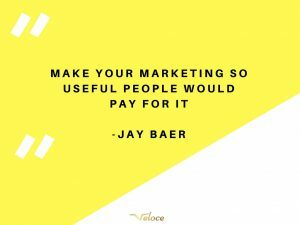 The influencer marketing quote by Jay Baer says something that is very true. In order to succeed with marketing (including influencer marketing), you need to focus on providing value. You need to have a value proposition that attracts people. This is the reason why content marketing has proven to be so effective in marketing. And remember, influencer marketing is a type of content marketing, because the foundation for influencer marketing is content. 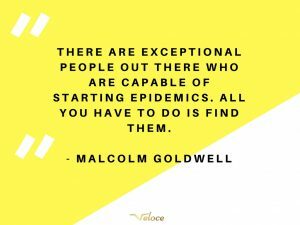 This influencer marketing quote by Malcolm Goldwell refers to the power of influencers, and the power that influencers have. With that said, it goes to show just how powerful and effecitve these can be if they are leveraged in marketing. Because people don’t trust advertisements anymore, they trust the recommendations from influencers. This is far too common, and we’ve seen history repeat itself over and over many times. Just like marketers claimed that the internet was a fad, there are marketers who say social media is a fad, and influencer marketing equally so. Despite the influencer marketing statistics, far from all marketers have understood the true power of influencer marketing, and since the social media landscape is so quickly evolving, it will leave them behind their competitors. This influencer marketing quote by Brian Solis describes the marketing landscape and where people’s trust is. People don’t trust the words of brands, becuase they know that everything they’ll say will be said to help them sell more. Social media influencers, on the other hand, don’t have the same agenda, and studies have found that they feel a responsibility in guiding their peers in buying decisions. What social media has done is it has given everyone a voice, and social media influencers in particular, and this is why brands need to re-evaluate their marketing strategies. This influencer marketing is incredibly true, and emhasises the importance of using power in the right way. 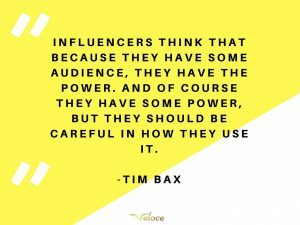 Influencers has the power in the sense that they have influence over people’s decisions and opinions, but it is crucial that they use their power in the right way. In worst case, if the power isn’t used in the right way, influencers will eventually lose their audience’s trust. This influencer marketing quote isn’t really a surprise. When you can speak from your heart, and use storytelling to talk about real-life experiences and things you’re genuinely passionate about, what you’re saying will come off as far more trustworthy. This is especially important for influencers, becuase in order to drive sales, people need to trust the influencers and their recommendations. 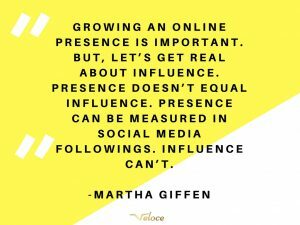 This influencer markeitng quote by Martha Giffen tells us that the numbers aren’t everything. The follower count of someone has, in theory absolutely nothing to do with influence, but it is what the numbers resemble that means something. It’s important to not get stuck in vanity metrics such as likes and followers, but instead go more in-depth to see how engaged and impacted the fans truly are in order to understand the true influence of social meida influencers. After all, for driving marketing results, it’s engagement that matters. Traditional display advertising has decreased significantly in popularity over the years, and this is in favor for other marketing methods that have proven to be a lot more effective. Influencer marketing is one of them. To succeed with influencer marketing, you need to partner with influencers who align with your business’s values and goals. Before you hop onto influencer marketing, you need to start with the foundation, and that begins at evaluating your own brand. It is only when you have other people’s best interest in mind that you will be able to build influence over people, becuase only when you show that you truly want people’s best, you’ll be able to gain people’s trust and ultimately also impact them. This is the foundation for becoming a social media influencer. In order to succeed with anything that includes partnerships with other people, it needs to be mutually beneficial, and by leveraging the power of influencers, you can amplify your own messages and content and reach a bigger audience which drives marketing success. 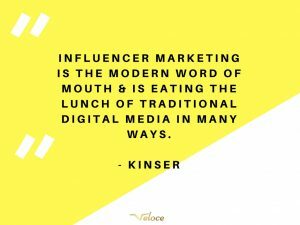 Personality is key in marketing, including influencer marketing, and this influencer marketing quote proves that. 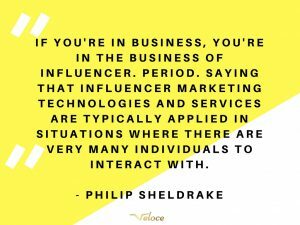 This influencer marketing quote mostly refers to the way you do your influencer outreach, and tells you that in order to get responses, you need to be personal and not just send generic messages to every single influencer you come across. Like I said earlier, relationships are only beneficial when they are mutually beneficial, and this is why you need to tell the influencer what value they get from it. 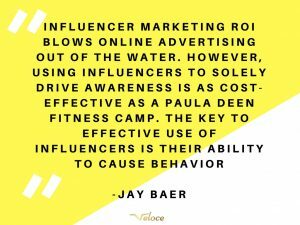 This influencer marketing quote talks about the importance of not just focusing on increasing brand-awareness, but also focusing on the most pwerful form of marketing which is advocacy. Influencer marketing is a form of advocacy, but at the same time, it also increases brand-awareness which is a win-win marketing situation. 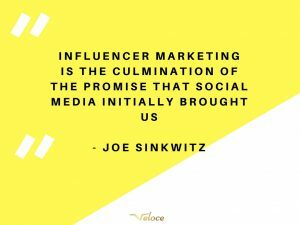 This is another influencer marketing quote that emphasises the importance of reaching out to social media influencers in the right way. 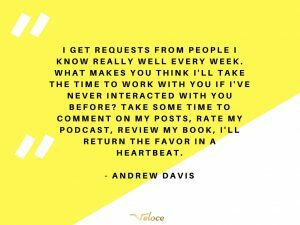 Large influencers get outreach emails and messages every single day, and in order to get a response, you need to make the message personal and provide them value before you ask them for the favor. When you provide value, you have the leverage. When you build strong relationships with influencers before you ask them to promote you, they’ll be much more likely to say yes when you ask them for it. Think about it, if your best friend asks you for a favor, you’re much more likely to say yes compared ot if a stranger asks you, right? When you use traditional advertising, you get the reach, but you don’t get the power and trust that comes with advocacy. 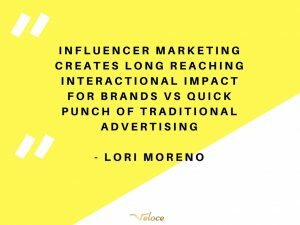 This is an important reason why influencer marketing has proven to be so effective, because you get both parts rather than one. People trust influencers but they don’t trust traditional advertisments. What social media has enabled us to do is communicate and interact with people from all parts of the world in a matter of seconds, and this influencer markerting quote goes to show just how incredible that opportunity is, becuase it allows us to have far more conversations than what would otherwise be possible. When running influencer marketing campaigns, you need to ensure that the influencers actually have true influence. If they don’t have influence over people, it will be impossible to drive any marketing results. The leverage great influencers have in marketing is that they have trust and influence over people, but if they don’t, it will be difficult or impossible to drive any measureable results. This influencer marketing quote by Mark Zuckerberg is a powerful one. It tells us the truth that people look up to, and trust other people, and this also goes to show that there is no trust in traditional advertising, and not brands without a personality either. The great news is that brands can now partner with influencers and have them spread the messages for the brands because people will actually listen to what the influencers are saying. Most brands try to sell with fancy words and by telling everyone how amazing they are, but the truth is that this doesn’t worrk very well. Poeple trust influencers, and the relationships they have with them, and this is what will make a true impact on them. 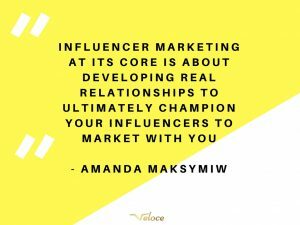 The only real way to drive sales is to influence people to buy from you, and this influencer markting quote emphasises just that. There are many ways you can get influence over people, but as a brand, it is generally tricky. 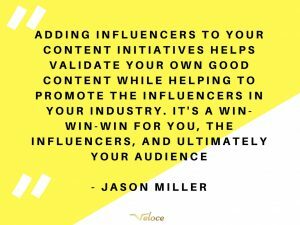 The good news is that this is where influencers come in and can help you spread your brand’s message for you, and get listened to while doing it. What social media has done is give everyone the opportunity to build an audience and become an influencer. Back in the days, the only people looked up to were celebrities and possibly top political leaders, but with social media’s birth, a shift has taken place, and now anyone anywhere can build their influence, and brands need to recognize this. It is crucial that brands and marketers understand the point that this influencer marketing quote is trying to make. People’s trust in brands is at an all-time low, and in order to succeed in the marketing landscape, brands need to realize that they are not the ones with the power anymore. 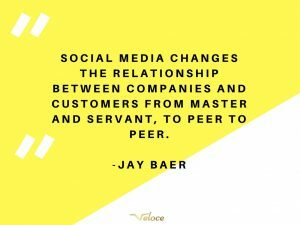 The people with the power are the consumers, and especially the influencers, because they can now communicate with the whole world in a matter of seconds through social media. This is why it is cruial to understand that you monitor what your customers are saying about your brand on socail media to understand the sentiment of your brand online, and then take appropirate action. Moreover, if you can get influencers to talk positively about you, it will be immensely beneficial. Again, this influencer marketing quote emphasises the importance of mutually benefical relationships, and it truly cannot be emphaises enough. To drive marketing results, you need to ask yourself “how can I bring other people value first?”, because when you bring other people value first, you have the leverage. Don’t just focus on what you want, but focus on what your cusotmers want, and try to give it to them. The fundamental definition of social media influencers is tha they have influecne over people, and that they have the ability to influence people’s decisions and opinons. As a result, if you can leverage influencers to talk positively about your brand in marketing, their words will be able to impact people in a way that you can only dream of. In the history of businessses, there has always been a huge gap between brands and customers, but since people trust peer recommendations, it is important that you, as a brand, get closer to your customers to better impact them. The good news is that a way to do this is by leveraging influencer marketing. 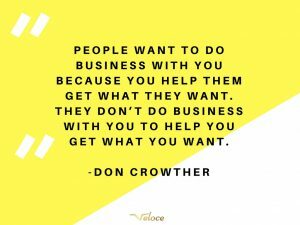 This influencer marketing quote by Duane Forrester is something that I’ve spoken about many times before. 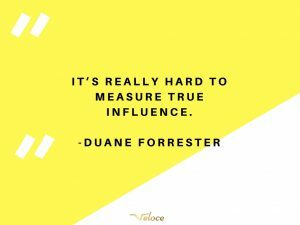 Far too many marketers and brands believe that vanity metrics such as follower count and likes is what defines true influence, but the fact of the matter is that it doesn’t. A follower count is essentially just a naumber in a profile, but what truly matters is what that number resembles, and if it resemble anything. 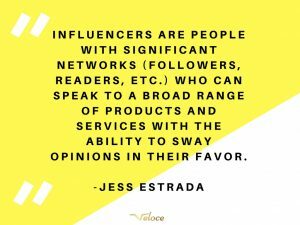 This is a reason why idenitfying suitable influencers is so tough, because just because someone has a lot of followers on social media doesn’t mean that they have influence ovver people and will help you drive great marketing results. 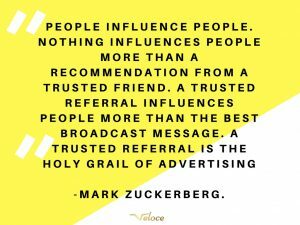 Moreover, that’s also the reason why we founded Veloce influencer network which focuses more on quality rather than quanitity, and to help marketers idenitfy people with true influence. Because after all, that is what drives marketing results. 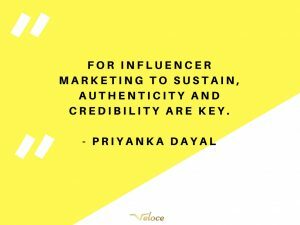 When marketers run influencer marketing campaigns, too many of them try to dictate too much about the campaign and how it is going to play out, but if you think about it, the influencer is the person who knows their audience best, and therefore, they will know how to drive the best results. I often say that you should give the influencers creative freedom, but review the campaign before it goes live so that it aligns with your brand’s values. Again, the influencer has spent years building their audinece, and so, they will be the ones who know what their followers will resnonate best with. When brajds try to dictate too much about the influencer markeitng campaign, it often comes off inauthetnic, and it ends up driving poor results. 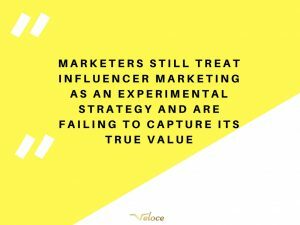 And often times, it is then blamed that “influencer marketing dosn’t work”, while the reality was that you didn’t trust the influencer to know what works the best. When people are engaged, it shows that they have been impacted by the message conveyed, and this is something marketers need to realize. 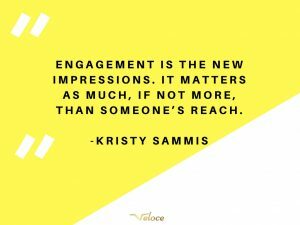 Focus on the quality of the engagement rather than looking at sole vanity metrics that, in theory, doesn’t mean anything. Your goal with influencer marketing is to drive real marketing results, not to generate a high amount of vanity metrics. To drive great marketing results with influencer marketing, the campaign needs to be authentic and genuine. This is why you need to ensure that you partner with influencers that align with your brand, and influencers who either are your customer, or might as well could be. If an influencer capaign is inauthentic, people will be able to sniff it from miles away, and the results won’t be that great. Micro-influencers are known to be more niche-specific and thus considered to be more experts within the niche they are operating in. Moreover, because they’re focused on a speicifc niche, they tend to attract a more targeted audience which is great for brands who have a target audinece who are in the same industry. 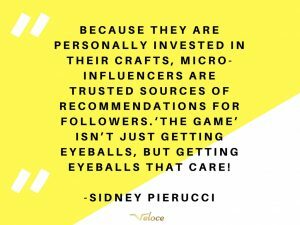 This is why brands shouldn’t neglect micro-influencers just because they have a smaller following, because the fact of the matter is that they can even be even more effctive in marketing than regular influencers. Just look at the micro-influencer statistics. 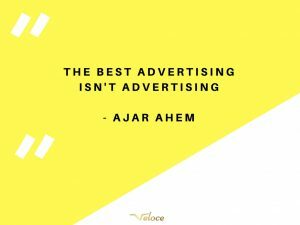 This quote by Ajar Ahem isn’t just an influcner marketing quote, but it is a quote that goes for all type of marketing. When amrketing doesn’t feel like marketing, it is much more impactful, and much more trustworthy compared to when it is solely done to promote. 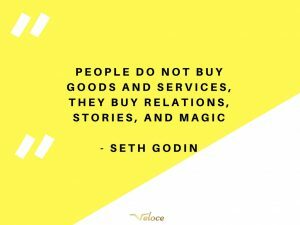 This is also a reason why content marketing (including influencer marketing) is so effective, because what it does it is provides people with content that they love, and then just leads to marketing benefits. A win-win in other words. If you’ve been operating in the digital marketing industry, or even if you’ve just been a user of social media, chances are, you’ve come across influencer marketing. 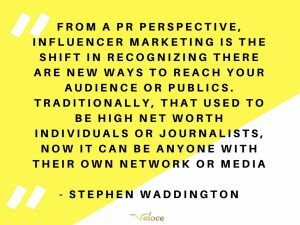 The influencer marketing industry has skrocketed in just a few years, to the point now where even the top largest corporates are using it, and starting to realize the true power of it. 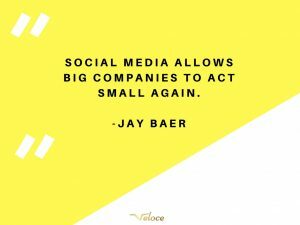 People’s attention is on social media, and more specifically, the social media influencers are the people on social media that have the attention. The best part is that people are looking up to social media influencers as they are known as industry experts where people can turn for advice. 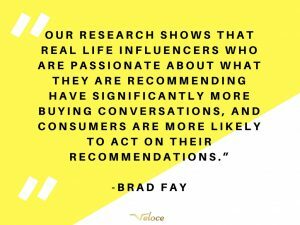 Most importantly, people trust the recommendations of influencers, and are therefore more likly to be impacted by them. That’s exactly what all of these influencer marketing statistics prove. There is no single solution-but lots of options. Thank you! I’ve just added your list to my article. Thanks a lot for this resource. This is by far the biggest list to date. I hope you all are having a great week. 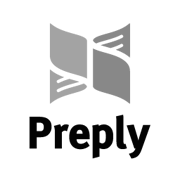 I just updated my site with your list. I hope you all are having a great week.